Lael takes her helmet off at the finish. She arrived in Antelope Wells at 4:59 PM MT, for a time of 15:10:59. Below, pushing to Antelope Wells. 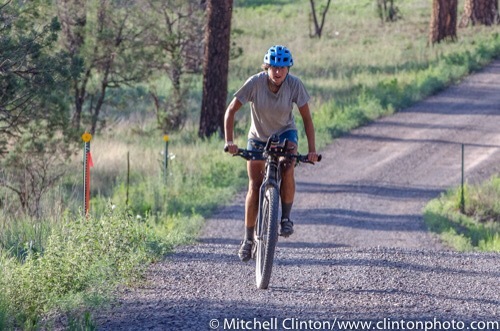 Lael Wilcox raced the Tour Divide in June. Arriving home in May from an extended period of bicycle travel, she prepared a bike for the race and rode from her home in Alaska to the start in Banff, over 2100 miles away. She finished the Tour Divide in 17:01:51, setting a new women’s record despite battling bronchitis for the first week, with lingering symptoms to the finish. The previous women’s record of 19:03:35 was set by Eszter Horanyi in 2012. Returning home to Alaska in July, Lael decided that she had the time, energy, and equipment for another fast ride down the Divide, in the same summer. Again, she prepared her bike and body and left Anchorage for Banff, taking a ferry from Whittier, AK to Bellingham, WA to shorten the distance to the start, this time only about 850 miles of riding. Following a few days of rest and preparation in Banff, Lael departed on an individual time trial (ITT) of the 2015 Tour Divide route on the morning of August 8, at 6AM. She finished in Antelope Wells, NM on August 23 at 4:59PM for a total time of 15:10:59. This establishes a new female course record and the fifth fastest time down the Great Divide Route (Mike Hall’s asterisked 2013 ride notwithstanding). To provide some context, this is five hours faster than Jay Petervary’s 2012 record time of 15:16:04, which stood for three years until the latest record-breaking rides earlier this summer by Josh Kato (14:11:37), Jay Petervary (14:12:03), Neil Beltchenko (14:12:23), Dylan Taylor (15:03:01), and Alex Harris (15:12:09). The six fastest times on the Divide were all recorded this summer. Naturally, for a race which takes two weeks and covers over 2700 miles of mountainous terrain, comparing rides which happened at different times is not easy, or fair. But records are kept, and the spirit of an ITT is to achieve a personal goal on the route, and if desired, to record a time which relates to other riders or an overall record. Lael reports the biggest challenges of the most recent ride were wheel-clogging mud north of Lima, MT, regular rain showers and thunderstorms all along the route, longer nights, and staying motivated while out on the course alone. For both rides this summer Lael rode a Specialized Stumpjumper Expert Carbon World Cup with carbon Chisel fork, with Revelate Designs luggage, SRAM XX1/XO1 gearing with 36T chainring, and an SP PD-8X dynamo hub with Supernova lighting. The details of her ride are recorded on the 2015 Tour Divide Trackleaders page, or link to her personal ride history on the LW ITT page. Pushing out of the Gila back in July, under clear skies. Photo courtesy of Mitchell Clinton, a local Silver City photographer. Lael pushed hard yesterday to get to Pie Town early, to get through the Gila, over the 8 mile section of the CDT, and into Silver City. But the weather had a different plan when a day with barely a 10% chance of rain turned dark and stormy late in the day, sounded the public warning system via cell networks, television, and radio. I received an automated message to my phone– the first ever– warning of heavy rain and hail, flash floods, winds up to 60 mph, and lightning. The warning area reached up into the Gila and south toward the border. The storm arrived to obscure a classic NM sunset, continuing until about 11PM and turning local roadways into rivers. I watched Lael continue through the Gila roller coaster at night, knowing that most of those roads through the pines are underlain with granite, rocky and sandy, and generally well drained. Lael reached the pavement and turned up the CDT about midnight, presumably in continuing rain showers. Her progress was predictably slow, she camped late, woke early and descended the pavement from Pinos Altos to Silver City at about 6AM. The airport in Silver City reported just under 3 inches of rain on Saturday evening. Regular lightning strikes persisted for hours. I passed Lael on the paved road south of Silver City on my way to I-10 and the border, slowing to take a photo out of the window of my rented Hyundai. She was riding a series of rollers in the aero position, the back of her black t-shirt faded to a dirty blonde. I have a cooler full of drinks, a big sandwich, two gallons of water, a bag of grapes, bananas, nectarines, and a box of cookies from the grocery store in Silver City. I will meet Lael at Antelope Wells later today. She will finish in less than 16 days, as long as the Separ Road– the final stretch of dirt– doesn’t hold any surprises from the monsoon. Lael stopped at the Toaster House this morning in Pie Town. I spent a night there with three CDT hikers back in 2011. Lael camped on the climb out of Abiquiu two nights ago, reporting that as she pushed up the steep technical climb in the dark she fell a few times, once landing on he rib without injury. Shaken, she stopped for the night and resumed at a faster pace in the AM. Once descending to Cuba, she hammered the pavement for the rest of the day, covering a total of 220 miles to camp just before midnight. She began riding at 4AM today along a wide gravel road to Pie Town. Daytime temperatures are warm in southern New Mexico, and nights are warm. Seasonal monsoons– manifest as afternoon thunderstorms– are still in force, although they ebb and flow on a daily and weekly basis. There may be several clear days followed by several stormy afternoons. Lael reported minor precipitation on the last few days in NM. In fact, I think she has seen some precipitation on more than half of her riding days since Banff. There continues to be a low risk of thunderstorms today, Saturday, while the threat of afternoon rain returns in force on Sunday and Monday. Lael mentioned several freezing nights in Colorado, including one night when her water froze outside Doyleville and she shivered through several hours of sleep. That morning she began riding before 4AM to warm up. I suspect last night was more pleasant, with forecast low temperatures around 50F now that she has left the high mountains. Daytime temperatures are forecast in the mid-80’s today. Lael just checked out of Pie Town, arriving 32 hours ahead of the pink LW bubble, and over and hour faster than the male record set by Jay Petervary in 2012. She has been behind this pace since stuck in the mud before Lima. If she pushes hard to the border she may stay on pace with this time, finishing sometime on Sunday night. If she pushes hard, she may be into the Gila by this afternoon if and when any rain falls. The roads around Pie Town present a high risk of clogging when wet due to the nature of the soils. The Gila is rocky and sandy, underlain by granite. If she pushes hard to the border she may stay ahead of Sunday thunderstorms as well. There is one final section of dirt south of Silver City that could get messy when wet. From Pie Town, Lael is just over 300 miles to the border. Lost in a burn on the south side of the Jemez Mountains with Joe and Cass, October 2012. Lael pushed 3000 ft up from Abiquiu last night, climbing fast to catch the final light of day. She continued on the increasingly technical track in the dark, recording similar speeds to many less technical climbs from days past. She camped early around 11PM after a long day which began at 4:30AM. Rising at 3:45AM, she finished the climb even faster than she had been moving the night before– still in the dark– eventually connecting to higher quality Forest Service roads on the north side of the Valles Caldera towards NM 126, and Cuba. Over a hundred miles of pavement extend beyond Cuba toward Grants, an authorized paved alternate to the official Great Divide Route and the de facto Tour Divide route for many years. From Cuba, there are only 500 miles left to the border. The climb out of Abiquiu is the tallest single ascent on the entire Great Divide Route, and marks the final major mountain section on the way to the border. The Gila and a brief section of CDT singletrack near Silver City are notable challenges in the remaining miles. Lael called very briefly while riding into Abiquiu, the rushing wind of 20mph obscuring most of our conversation. She said she was feeling good, ready to be finished, and still carrying enough food from Del Norte to get to Cuba, augmented with a few bags of Cheetos from the snack shack in Vallecitos (notably, not much of a town in the middle of nowhere). Buying cheese flavored puffed corn from tiny roadside shops will always remind me of Lesotho and South Africa. I’m in Salt Lake City en route to Tucson and Silver City. I’ll be at the border when Lael finishes. Cruising through the Land of Enchantment, circa October 2011 on the Great Divide Route in El Rito, NM. Lael was riding a Surly Long Haul Trucker at the time, recently converted from drop bars to an On-One Mary handlebar in Santa Fe at The Broken Spoke. Lael camped just short of the NM border yesterday, reaching up and over Indiana Pass from Del Norte as daylight faded, and descending to Platoro and beyond into the night. She woke early this morning to begin riding up Cumbres Pass, then onto dirt and into NM. We spent a winter living in Albuquerque and like everyone who has heard the jokes about the “Land of Entrapment”, we love New Mexico. As the miles pile up, I know that Lael is reaching deeper and deeper to find the physical energy and motivation to continue. Crossing into New Mexico is a homecoming, and also the begging of the end of this ride. I watched her crawl up to Brazos Ridge this morning on Trackleaders, knowing the kind of chunky New Mexico roads she was riding, and knowing that she was still warming up for the day, in a sense. But she has found her stride this morning as she descends from the second to last big mountain on the route. The last big climb and the tallest total ascent on the route is south of Abiquiu en route to Cuba. I leave tonight at midnight to arrive in Tucson on Friday morning and Silver City by Friday evening. Lael should be passing through Silver City on Sunday, most likely. Any ABQ or Santa Fe people want to visit Silver City for the weekend? My friends Tim and Chloe are playing music in town on Saturday afternoon, I should have a bike to ride, and we can sleep outside. John, Jeremy, Nancy, Cass, Rusty, Melissa, Wyatt?